Croatia's Borna Coric produced a masterful display of power-hitting to stun holder Roger Federer 6-4 6-4 in the Shanghai Masters. 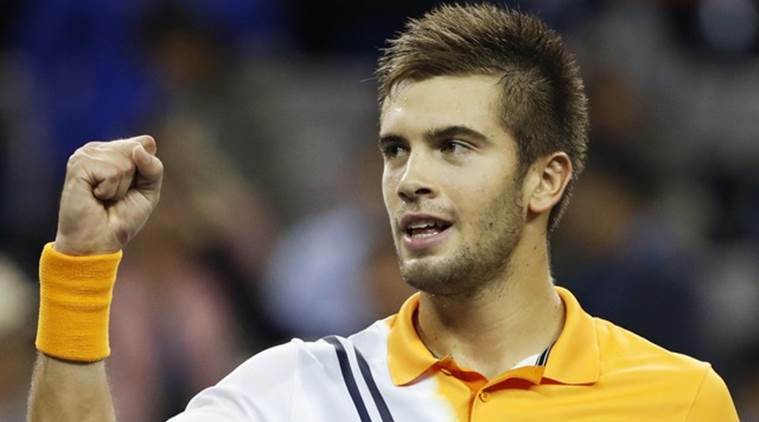 Croatia’s Borna Coric produced a masterful display of power-hitting to stun holder Roger Federer 6-4 6-4 in the Shanghai Masters on Saturday and will face Novak Djokovic in the final. Coric was quick out of the blocks at the Qi Zhong Stadium as he broke in the opening game against the top seed and only lost five points on serve to clinch the first set in 34 minutes. Federer, competing in his first ATP tournament since a shock last-16 exit at the U.S. Open, struggled for control against Coric’s bludgeoning returns as the 13th seeded Croat clinched another early break to reach his first ATP Masters final. The 21-year-old got his second straight win over Federer, having beaten the Swiss to lift the Halle title in June. Coric, world-ranked 19th, will face one of his toughest tests of the season against Djokovic in Sunday’s showpiece. Three-time Shanghai Open winner Djokovic stormed past German Alexander Zverev 6-2 6-1 in Saturday’s earlier semi and claimed the world number two ranking from Federer. Djokovic did not face a break point en route to a 59-minute victory as he extended his winning streak to 17 ATP matches. Second seed Djokovic, who has returned to his brutal best this season with Grand Slam wins at Wimbledon and the U.S Open, will surpass Federer as world number two when the next edition of the ATP rankings are released on Monday. “I did everything I intended to do on my end,” the 31-year-old Serb, chasing his 32nd Masters title, said. Djokovic, who beat South African Kevin Anderson 7-6 6-3 to reach the last four, knows a fourth Shanghai title would help him trim Rafa Nadal’s lead at the top of the rankings. The Spaniard skipped the Asian swing to recover from a knee injury.